Friday Night Fights: Thunder - Round 5: And The Wind Whispers "Hulk Smash!" 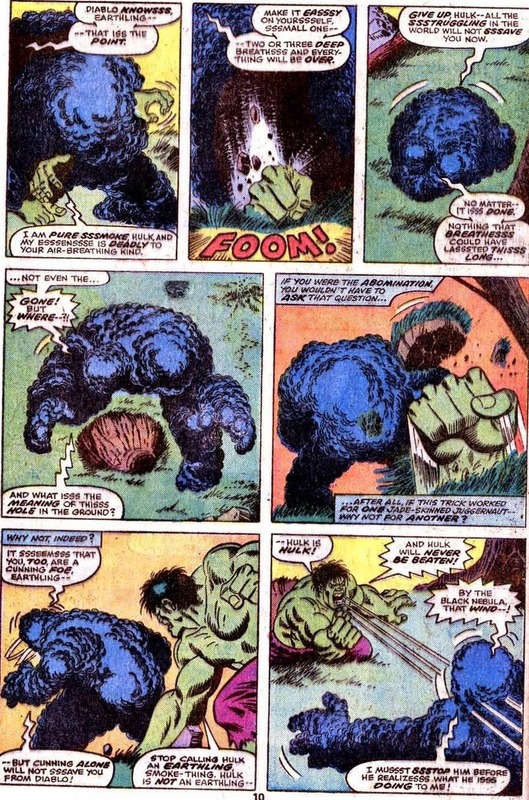 The Hulk has faced a wide variety of foes. Usually he can get by with his great strength alone, but occasionally he meets an opponent against whom he has to think his way to victory. 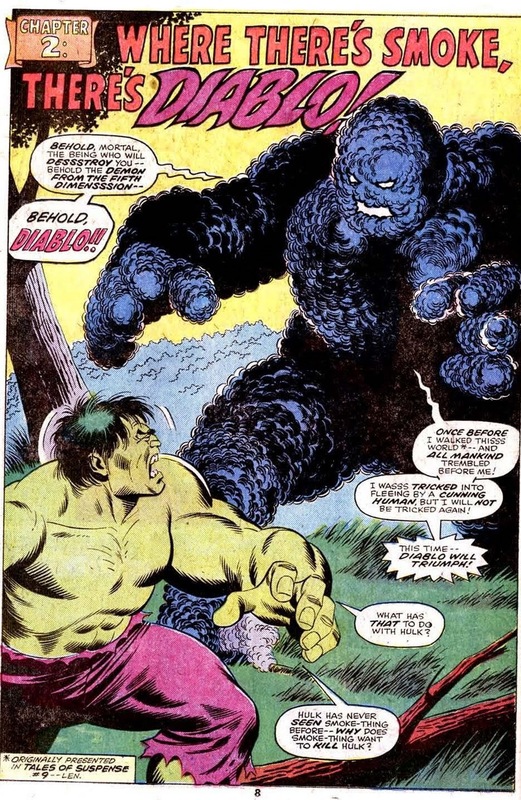 Such is the case in tonight's featured fight from Incredible Hulk Annual#5 by Len Wein, Chris Claremont, Sal Buscema, and Jack Abel. Synopsis: a mysterious enemy has unleashed five monsters (each of whom originally appeared in a Jack Kirby Atlas-era horror comic) against our green-skinned behemoth. For tonight's round of Friday Night Fights: Thunder, we'll focus on the first opponent, a smoke creature named Diablo. 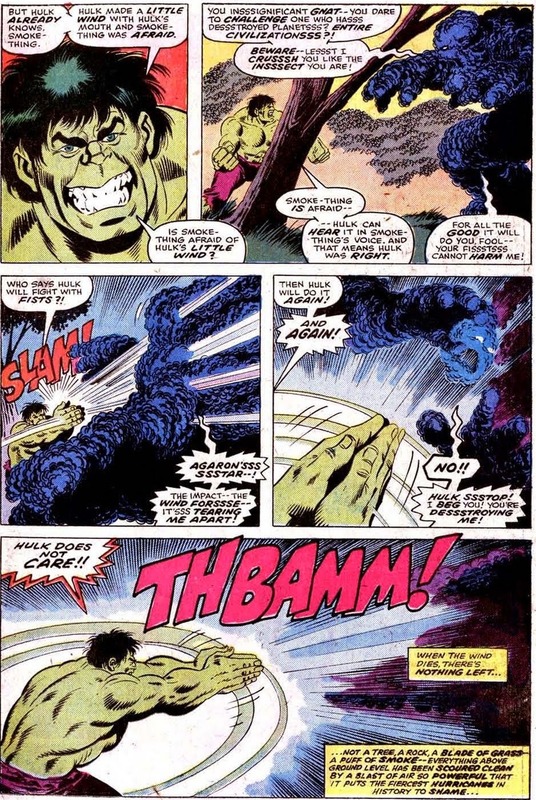 The Hulk, as usual, attempts to straight-up smash his opponent. But this foe doesn't smash so easily. It looks like ol' Diabs is going to asphyxiate our Emerald Goliath. But he's about to learn not to count out Jade Jaws so easily. 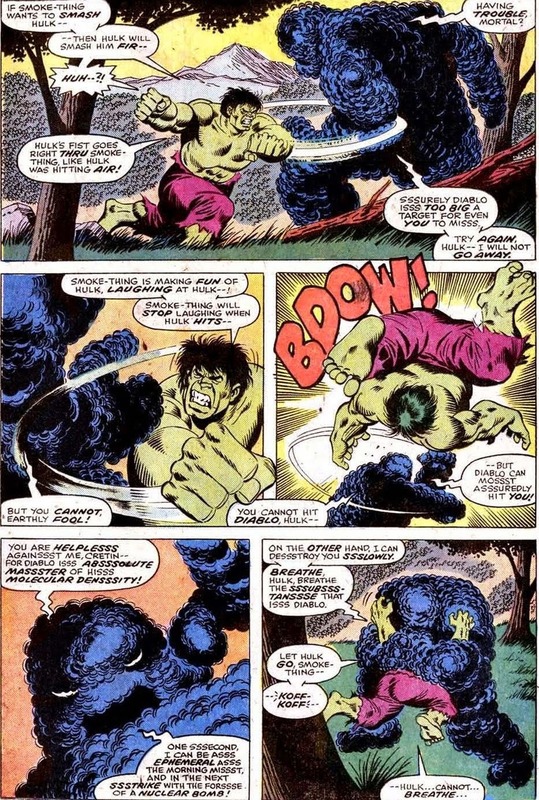 Wow, the Hulk really smoked him! Tonight's fight music is this windy wonder by The Jimi Hendrix Experience. For more air-powered altercations, click here. And don't forget to vote! Friday Night Fights: Thunder - Round 4: What Wine Goes With Knuckle Sandwiches? I had to miss last week's round of Friday Night Fights: Thunder due do a bout of stomach flu, so I'm back this week with both guns blazing. 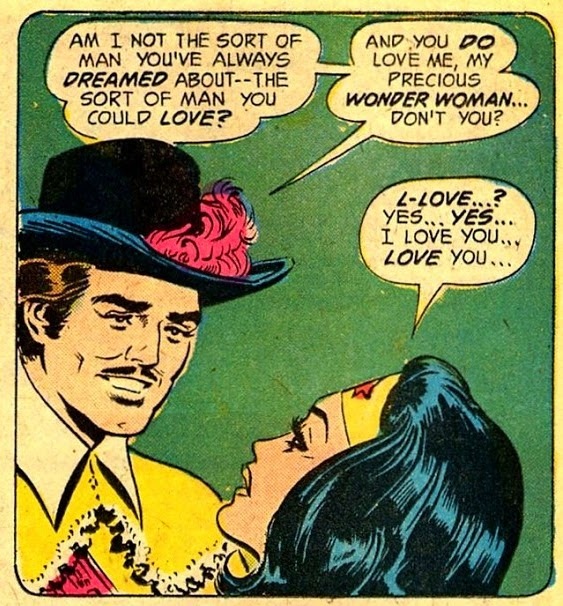 And since it's the week of Valentine's Day, I'm going with someone who's both a lover and a fighter, namely Bat Lash. 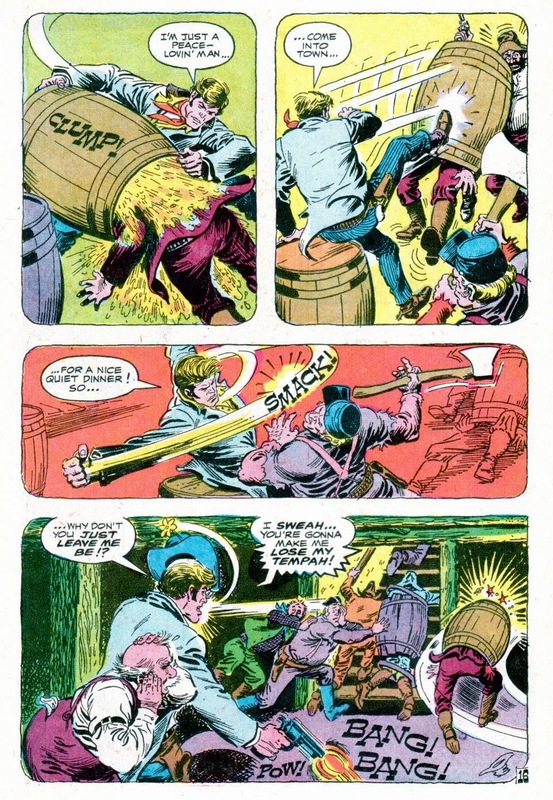 This round of western wine-related wildness comes courtesy of Showcase#76 by Sergio Aragones and Nick Cardy. Synopsis: Bat Lash stops in the town of Welcome to arrange to cook the pheasant he just killed. Trouble is, Welcome does not live up to its name, seeing as how it's just been overrun by an evil gang. 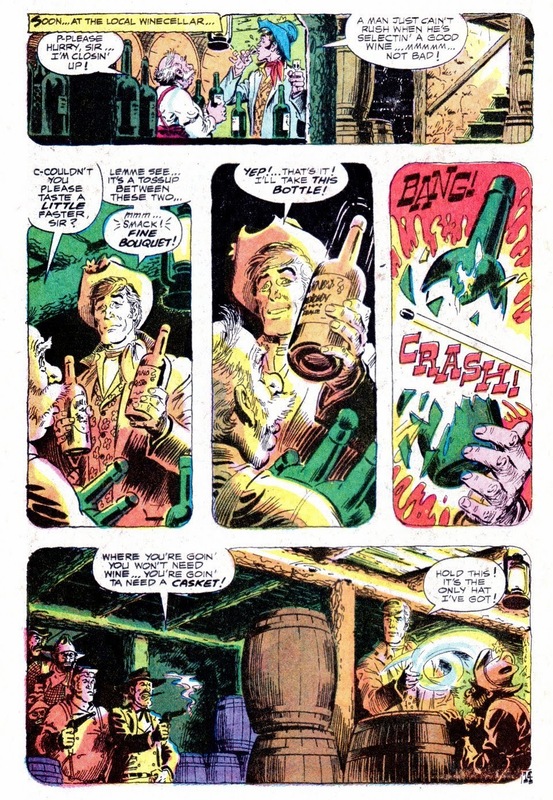 Bat just wants to eat his meal and leave, but the gunmen, afraid he's a federal Marshall, keep trying to kill him, including this moment when he's trying to pick the right wine to go with the roast bird. 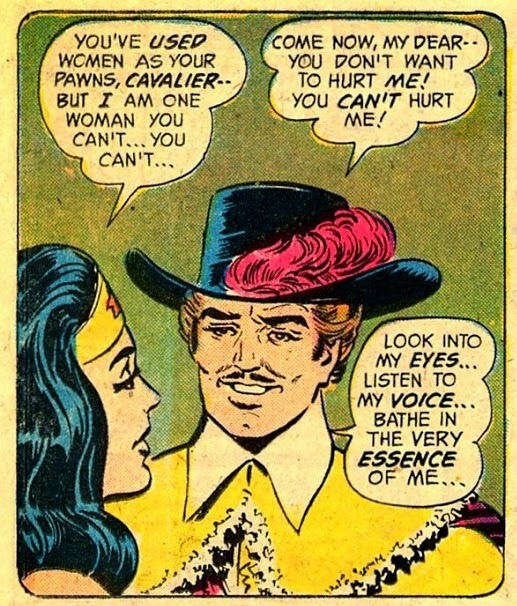 Spoiler: He never does get to enjoy that dinner. Since tonight's fight involved a man and his wine, I thought this Def Leppard song would be appropriate fight music. 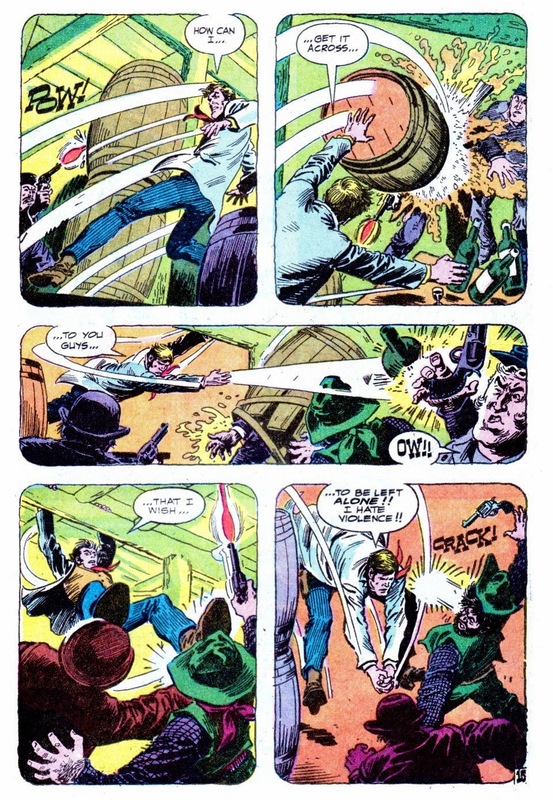 For more vineyard vanquishing, click here. And don't forget to vote!